Bristol, New Hampshire, located in the central part of the state, is a town of just over 3,000 people located in Grafton County. Approximately half the population lives in a settlement area located at routes 3A and 104.
has the largest freshwater beach for swimming in the New Hampshire State Park system. Visitors can also enjoy hiking, fishing, and boating on the lake. Bristol is located in the southeastern portion of Grafton County, which is a largely rural area in New Hampshire. The White Mountain National Forest covers nearly half the land in the county, with many of the state’s highest mountains. The Appalachian Trail passes through many towns in the county, and tourists flocked to Grafton County to see the Old Man of the Mountain, until its collapse in 2003. Grafton County was among the original five counties in New Hampshire, created in 1769. 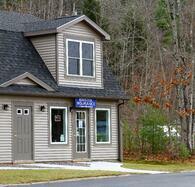 This opened up the area that would become Bristol, NH for settlement in 1770. Bristol was part of the settlement of New Chester, which was later separated into several towns. Bristol was incorporated in 1819, taking land from the towns of Bridgewater and Hill. Bristol, NH is named after Bristol, England, due to deposits of clay and sand that were similar to those used to make china and pottery in England. In New Hampshire, the material was used to make high-quality Bristol bricks. Taking advantage of the water power available from the rivers, everything from paper to leather and cloth and even piano stools were manufactured in Bristol. With Newfound Lake and the nearby White Mountains, Bristol has also been a tourist destination since the middle of the 1800s. Hotel Bristol and the G.G. Brown Hotel, as well as the Franklin and Bristol railroad were all built to support the flourishing tourist trade in the 1870s. Newfound Lake is the fourth largest in New Hampshire, and is said to be one of the cleanest lakes in the world. Fed by 8 underground springs, this Newfound Lake is host to a number of recreational activities and events throughout the year. 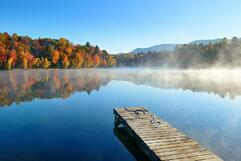 Newfound Lake is also one of the deepest in New Hampshire, with its deepest point being 183 feet. The lake is 2.5 miles wide and 7 miles long, and has 22 miles of shoreline in Bristol, Bridgewater, Hebron, and Alexandria. The lake also has two lighthouses on its shores. Visitors also flock to the lake for its 22 varieties of fish, boating, and hiking.